Elon Musk: What is it like to work for the SpaceX, Tesla chief? 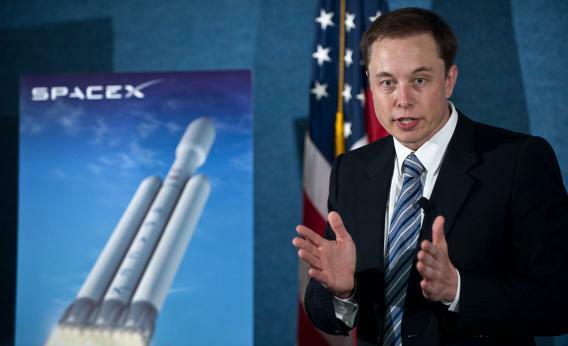 SpaceX CEO Elon Musk unveils the Falcon Heavy rocket at the National Press Club in Washington, D.C., on April 5, 2011. After working for Elon for more than five years at SpaceX as the head of talent acquisition, there are many potential answers to this question. Any answer I might give will be completely colored by my own experiences, so full disclaimer: This is not an unbiased piece free of personal narrative. It is said that you cannot dream yourself a character; you must hammer and forge one yourself. If any leader and any company has done that, and continues to do that, it is SpaceX. To try and capture in words what working with Elon is like, I’d like to share some specific memories, particularly of one really rough day and its epic aftermath. On Aug. 2, 2008, eight months after I joined the company, SpaceX launched its third flight of the Falcon 1 launch vehicle. Falcon 1 was the predecessor to the Falcon 9 launch vehicle that the company flies today. It was a defining moment for the company. Elon had a couple years prior stated in the press that his $100 million personal investment in the company would get us up to three tries, and if we couldn’t be successful by the third flight, we may have to admit defeat. In addition to the pressure created by this narrative in the press, the lobbyist armies of our competitors (the largest, most powerful defense contractors in the world) had been in overdrive in Washington, D.C., trying to undermine SpaceX and damage our credibility by painting us as too risky and inexperienced in order to protect their multibillion-dollar interests in the space-launch business. SpaceX executed a picture-perfect flight of the first stage (the portion of the flight that gets the vehicle away from Earth’s gravity and where the vehicle experiences maximum dynamic pressure, or basically where the conditions on the vehicle are physically the harshest), clearing some of the highest-risk points of mission. However, shortly after the first-stage flight, immediately following stage separation (when the first stage of the vehicle detaches and falls away from the second stage of the vehicle that continues its journey to space), we lost the vehicle and mission. SpaceX Vice President of Propulsion Tom Mueller, the modern-day godfather of rocket science and one of the most brilliant scientific minds on the planet, and his team had done such a great job redesigning the vehicles’ engines systems that they were even more efficient and powerful than in some ways projected. We turned off the first-stage engine and then proceeded to separate the vehicle stages; however, when the stages uncoupled, there was still a little leftover “kick,” or thrust, in the first-stage engine. Our first stage literally rear-ended our second stage immediately after we had tried to separate the two sections of the vehicle. It was a devastating, emotional experience. I stood around with the then-350 or so employees, and we cheered the vehicle on as it took off. As we were watching the mission clock and knew that the stages were about to separate, the video feed was cut. The company is on a 20-second viewing delay from the mission-control team, as we were projected to the external press feed, which is delayed in case of major mission anomalies. So when we lost video, we knew something had gone wrong in a big way. Elon and about seven or eight of the most senior technical people at SpaceX were commanding the mission from a trailer in the back of the Hawthorne factory. We all waited anxiously for the trailer door to open and for someone to tell us something. The mood in the building hung thick with despair. You have to keep in mind that by this point SpaceX was six years old, and many people have been working 70- and 80-plus-hours a week, swimming against extremely powerful currents—like difficult barriers in technology, institution, politics, and finance—by sheer force of their blood and sweat. They had all given so much. They were mentally and physically exhausted and really needed a win in order to replenish their spiritual wells—and give them the faith to keep following this man up a treacherous mountain that had depleted the hopes and resources of the many others who had come to conquer it. This night would forever impact the future of the company. It had the potential to send the company into a downward spiral, from which we may not have ever recovered. A failure in leadership would have destroyed us not only from the eyes of the press or potential consumers; it would have destroyed us internally. We knew this was going to be hard. It is, after all, rocket science. He then listed the half-dozen or so countries that had failed to even successfully execute a first-stage flight and get to outer space, a feat we had accomplished successfully that day. Elon had (in his infinite wisdom) prepared for the possibility of an issue with the flight by taking on a significant investment (from Draper Fisher Jurvetson, if I recall correctly), providing SpaceX with ample financial resources to attempt two more launches and giving us security until at least flight No. 5 if needed. Finally, that we need to pick ourselves up and dust ourselves off, because we have a lot of work to do. Then he said, with as much fortitude and ferocity as he could muster after having been awake for 20-plus hours by this point, that “For my part, I will never give up, and I mean never,” and that if we stick with him, we will win. I think most of us would have followed him into the gates of hell carrying suntan oil after that. It was the most impressive display of leadership that I have ever witnessed. Within moments, the energy of the building went from despair and defeat to a massive buzz of determination as people began to focus on moving forward instead of looking back. This shift happened collectively, across all 300-plus people in a matter of not more than five seconds. I wish I had video footage, as I would love to analyze the shifts in body language that occurred over those five seconds. It was an unbelievably powerful experience. Within a matter of hours, the SpaceX team identified the likely cause of the launch failure. Typically turnaround time from others in the launch business can range from weeks to months for failure investigations. Our team combed through every ounce of data to make sure we understood exactly what went wrong as quickly as possible. By Aug. 6, 2008, we announced the results of our investigation and came 100 percent clean with our supporters and customer community in order to make sure we could retain their trust in this difficult time. In seven weeks, we had another rocket fully manufactured, integrated, and on location ready to fly again. No one else could have done this in less than six months with unlimited human and financial resources; SpaceX did it in six weeks, with less than 400 people and on a restricted financial diet. On Sept. 28, 2008, SpaceX flew its Falcon 1 launch vehicle from Kwajalein Atoll in the South Pacific and executed its first 100 percent successful launch. It became the world’s first privately built rocket to achieve Earth orbit—an accomplishment of truly epic portions and a task previously completed by only six of the mightiest nations in the history of the world. It was a much-needed and much-deserved victory for the entire SpaceX team and, as it hopefully will turn out, the future of humanity overall. So for those who ask the question, this is in my opinion the true character of Elon Musk. Undeterred in the face of all odds, undaunted by the fear of failure, and forged in the battlefields of some of the most terrifyingly technical and capital-intensive challenges that any human being could choose to take on. Somehow he comes out alive, every time—with the other guy’s head on a platter. Working with him isn’t a comfortable experience; he is never satisfied with himself, so he is never really satisfied with anyone around him. He pushes himself harder and harder, and he pushes others around him the exact same way. The challenge is that he is a machine and the rest of us aren’t. So if you work for Elon, you have to accept the discomfort. But in that discomfort is the kind of growth you can’t get anywhere else and worth every ounce of blood and sweat. Is Elon Musk a genius? What are his primary talents? Do they go beyond just being really adept at managing nerds? How did Elon Musk become so successful? Has anyone found any loopholes in the Hyperloop project detailed by Elon Musk?